خبرگزاری رسمی جمهوری اسلامی ایران اعلام کرد عبدالمالک ریگی رهبر گروه جندالله که به "محاربه و افساد فی الارض" متهم شده بود بامداد یکشنبه به دار آویخته شد. به گزارش ایرنا آقای مالکی مرتکب 79 مورد قتل، جرح، اخاذی، ایجاد رعب و وحشت، آدم ربایی و گروگانگیری، همکاری با بیگانگان و اخذ کمک های مالی و اطلاعاتی شده بود. عبدالمالک ریگی در یکی از شعبه های دادگاه انقلاب اسلامی تهران به ریاست قاضی توحیدی به اعدام از طریق آویختن از چوبه دار محکوم شد. گفته می شود خانواده برخی از مجروحین و قربانیان فعالیت های گروه جند الله نیز در مراسم اعدام حضور داشتند. دادگاه انقلاب عبدالمالک ریگی را عامل تشکیل گروه جند الله، 15 فقره آدم ربایی مسلحانه، قتل عمدی دهها نظامی و غیرنظامی، سرقت مسلحانه و موارد متعدد دیگری دانست. او همچنین متهم به ارتباط با سرویس های غربی بود. دولت های غربی حمایت از او را رد کردند. دادسرای عمومی و انقلاب تهران پیش تر اعلام کرد آقای ریگی در جریان محاکمه مسئولیت کلیه اقدامات جند الله را بر عهده گرفت و تمامی موارد اتهامی مطروحه در کیفرخواست صادره از سوی دادستانی را پذیرفت. دادستان خواستار اشد مجازات برای آقای ریگی شد. گفته می شود او "تقاضای عفو" کرده بود که توسط رئیس قوه قضائیه رد شد. به گزارش ایرنا گروه جند الله از سال 1382 تاکنون مرتکب قتل 152 نفر از نیروهای انتظامی و مردم غیرنظامی و نیز مجروح شدن 320 نفر شده است. عبدالمالک ریگی، تا پیش از دستگیری در اسفند سال گذشته رهبری جند الله را برعهده داشت. TEHRAN — Abdolmalek Rigi, head of the Sunni rebel group Jundallah who waged a deadly insurgency in Shiite Iran's southeastern province of Sistan-Baluchestan, was executed on Sunday, state media reported. "After the decision of the Tehran revolutionary tribunal, Abdolmalek Rigi was hanged on Sunday morning in Evin prison," Iran's official news agency IRNA said, quoting a court statement. "The head of the armed counter-revolutionary group in the east of the country... was responsible for armed robbery, assassination attempts, armed attacks on the army and police and on ordinary people, and murder," the statement said. Rigi was captured in a dramatic operation in February while on a flight from Dubai to Kyrgyzstan, when Iranian warplanes forced the plane he was travelling in to land in Iran. His hanging comes less than a month after his brother Abdolhamid was executed on charges of terrorism. Rigi led the shadowy Jundallah (Soldiers of God) -- a group he said was fighting to secure rights for Sunni Baluchis who form a significant population in Sistan-Baluchestan bordering Afghanistan and Pakistan. A top Sunni cleric who represents the province in the Assembly of Experts -- the body which supervises the activities of Iran's supreme leader -- said the people of Sistan-Baluchestan were "very happy" with Rigi's execution. "The execution of Abdolmalek Rigi is the result of his shameful acts, and other criminals should be aware that if they continue with their outrageous acts against Islam in the country, they will meet the same fate as this criminal," IRNA quoted Nazir Ahmed Salami as saying. According to the agency, Sistan-Baluchestan governor Ali Mohammad Azad said the people of his province had wanted Rigi to be punished. "People wanted the head of this rebel group to be tried and punished as soon as possible, and this took place after legal proceedings in the presence of victims' families," Azad was quoted as saying. IRNA, quoting the court statement, said Rigi's group was "responsible for the killing of 154 members of security forces and other innocent people and wounding of 320 people since 2003." It said Jundallah was "linked to members of foreign intelligence services, including members from US and Zionist regime's intelligence services under the cover of NATO." It also had ties with the intelligence services of some Arab states and the counter-revolutionary group People's Mujahedeen, the statement said. Rigi, who the statement said had appealed for clemency, was also charged with forming the "terrorist group Jundallah which was fighting the Islamic republic." "He collaborated and ordered 15 armed abductions, confessed to three murders, and ordered the murders of tens of citizens, police and military personnel through bombings and armed actions," it added. Soon after his arrest, Jundallah claimed it had appointed Muhammad Dhahir Baluch as its new leader, the US-based SITE monitoring agency reported. According to SITE, Jundallah said in a website posting: "Let the (Iranian) regime know that it will face a movement that is stronger and much more solid than ever before and one whose existence it has not been aware of." A few days after Rigi's arrest Iranian state media alleged that the United States had offered to provide the militant aid to battle the Islamic regime. "They (Americans) said they would cooperate with us and will give me military equipment," Rigi said in a taped statement broadcast on state-run English-language Press TV. Tehran has long accused the group of being trained and equipped by American and British intelligence services as well as by Pakistan in a bid to destabilise the government. Washington denies the charges. Rigi's brother Abdolhamid was hanged in Zahedan, the capital of Sistan-Baluchestan, on May 24, state media had reported. He was convicted of "Moharebeh" (armed opposition to the state) and being "corrupt on earth by membership in a terrorist group." The leader of a Sunni militant group has been executed in Iran for his involvement in "terrorist" attacks in the Islamic state, state media report. Abdolmalek Rigi, head of Jundullah, was hanged at dawn at Tehran's Evin prison in the presence of the families of its victims, the Irna news agency said. Mr Rigi was accused of being behind a series of deadly bombings and raids in the province of Sistan-Baluchistan. He was arrested in February while on a flight from Dubai to Kyrgyzstan. Founded in 2003, Jundullah (Soldiers of God) says it is fighting to defend the human rights, culture and faith of ethnic Baluchis. The majority of Iran's ethnic Baluchi population live in Sistan-Baluchistan and adhere to the Sunni branch of Islam. They claim that as a minority in a Shia state, they are persecuted by the authorities. Sistan-Baluchestan is also the most impoverished, underdeveloped and sparsely-populated of Iran's provinces. Drug trafficking is a major problem, and kidnappings and armed clashes are common. Iran's government says Jundullah receives support from the US, UK and Pakistan, an allegation which all three countries have denied. Four months after being captured by Iranian security forces when he was flying over the Persian Gulf en route to Kyrgyzstan, Mr Rigi was hanged on Sunday morning in accordance with a decision by the Tehran Revolutionary Court. "The head of the armed counter-revolutionary group in the east of the country... was responsible for armed robbery, assassination attempts, armed attacks on the army and police and on ordinary people, and murder," a court statement said. Jundallah was "responsible for the killing of 154 members of security forces and other innocent people and wounding of 320 people since 2003" and was "linked to members of foreign intelligence services", it added. Mr Rigi had allegedly pleaded guilty to forming the "terrorist group Jundallah which was fighting the Islamic republic" and a number of other charges. "He collaborated and ordered 15 armed abductions, confessed to three murders, and ordered the murders of tens of citizens, police and military personnel through bombings and armed actions," the court statement added. Jundullah has said it was responsible for a string of high-profile attacks in Sistan-Baluchistan, including a suicide bombing near the Pakistani border that killed 42 people, including six senior Revolutionary Guards commanders, and a bombing in a Shia mosque in Zahedan that killed 25 people. Shortly after his arrest, state media reported that Mr Rigi had admitted that he had been on his way to a meeting with a "high-ranking person" at the US military base at Manas in Kyrgyzstan when he was captured. "They said they would co-operate with us and would give me military equipment," he said in a video statement broadcast on Iranian TV. Despite the loss of their leader, the confrontation between Jundallah and the Iranian authorities has shown no sign of abating. The group recently asserted in a statement: "Let the regime know that it will face a movement that is stronger and much more solid than ever before and one whose existence it has not been aware of." Mr Rigi's younger brother, Abdolhamid, was captured in Pakistan in 2008 and extradited to Iran. State media reported that he was executed last month in Zahedan after being convicted of terrorism. خبرگزاری هرانا - سحر گاه امروز یک زندانی در زندان مرکزی اصفهان به جرم حمل و نگهداری مواد مخدر اعدام شد. بنا به اطلاع گزارشگران هرانا، یک زندانی مرد به اتهام حمل و نگهداری مواد مخدر برای مصرف شخصی که پیشتر از سوی شعبه چهار دادگاه عمومی اصفهان به اعدام محکوم شده بود و پس از تائید توسط دادستانی کشور در سی و یکم خرداد ماه سال گذشته در محوطه زندان مرکزی اصفهان اعدام شد. شایان ذکر است نامبرده دو مرتبه درخواست عفو به کمیسیون عفو و بخشودگی قوه قضائیه ارائه داده بود که هر باز درخواست از سوی کمیسیون مذبور رد شد. واحد آمار،نشر و آثار مجموعه فعالان حقوق بشر در ایران با احتساب اعدامهای امروز تعداد اعدامیان از اول خرداد ماه را 32 تن اعلام کرد. خبرگزاری هرانا، سحرگاه امروز 13 تن از زندانیان زندان قزل حصار کرج که پیشتر در دادگاه های عمومی و انقلاب به اعدام محکوم شده بودند، به دار آویخته شدند. بنا به اطلاع گزارشگران هرانا، روز گذشته 26 تن از زندانیان محکوم به اعدام جهت اجرای حکم به قرنطینه زندان قزل حصار منتقل شدند. محمد مصطفایی، وکیل پایه یک دادگستری روز گذشته در مصاحبه با رسانه های برون مرزی خبر انتقال زندانیان را از طریق یکی از موکلین خود به رسانه ها اعلام نمود. آقای مصطفایی اعلام داشت که اکثر این زندانیان درخواست عفو به کمیسیون مربوطه ارائه نموده بودند که مورد موافقت قرار نگرفته است و در پرونده برخی از این افراد سابقه کیفری وجود نداشته است. از اسامی و چگونگی اجرای حکم این افراد اطلاعی در دست نیست و رسانه های حکومتی تا کنون خبر اجرای حکم این تعداد زندانی را با ذکر جزئیات اعلام نکرده اند. (Reuters) - Iran has hanged four people convicted of smuggling drugs in the central province of Yazd, the semi-official Fars news agency reported on Thursday. "These four people were hanged in the central prison of Yazd province after they were convicted of drug smuggling," Fars said. Human rights groups often criticise Iran and say the Islamic republic has one of the highest execution rates in the world. Islamic Republic (Iran) hangs 5 members of "terrorist groups"
TEHRAN, May 9 (Xinhua) -- Tehran's Public Prosecutor Office announced that Iran hanged five members of "terrorist groups" in Tehran on Sunday, the local satellite Press TV reported. Five people were executed in Tehran's Evin prison early Sunday over their involvement in bomb attacks and links to terrorist groups, the report said. Three of them arrested in 2006 were in possession of weapons and explosives in their houses and convicted for their involvement in a failed bomb plot in the capital Tehran, according to Press TV. The failed attack was organized by the Iraqi-based separatist Party of Free Life of Kurdistan (PJAK), which is the Iranian offshoot of Turkey's outlawed Kurdish Workers' Party (PKK). The forth person, a woman, was captured when trying to plant a bomb underneath a vehicle near one of Iran's Islamic Revolution Guards Corps (IRGC) military bases in Tehran, who later confessed that she was conducted by the PJAK to do some explosions in Tehran, according to Iran's official IRNA news agency. 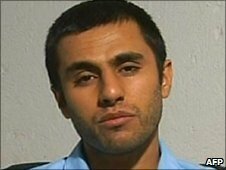 The last of the five was convicted for complicity in a deadly bombing in the city of Shiraz in 2008, said Press TV. Farzad Kamangar, Ali Heidarian, Farhad Vakili, Shirin Elmholi Atashgah, Mehdi Islamian were identified as the executed people in Tehran on Sunday, according to IRNA. Farzad Kamangar, Ali Haydarian, Farhad Vakili, Shirin Alam- Houli and Mehdi Eslamian were members of the Party of Free Life of Kurdistan (PJAK), an offshoot of the Kurdistan Workers Party (PKK) which took up arms in 1984 for an ethnic homeland in southeast Turkey and northwest Iran. "The five, including one woman, were hanged inside Tehran's Evin prison Sunday morning ... They confessed carrying out deadly terrorist operations in the country in the past years," IRNA said. Iran sees PJAK, which seeks autonomy for Kurdish areas in Iran and shelters in Iraq's northeastern border provinces, as a terrorist group. In recent years, Iranian forces have often clashed with PJAK guerrillas, who operate out of bases in northern Iraq. Kurds are large minorities in Turkey, Iran, Iraq and Syria. The five Kurdish activists were convicted in 2008. They were hanged after a Supreme Court upheld their death sentences. IRNA said three of them were founders of PJAK group in Iran and were also involved in bombings that killed members of Iran's Revolutionary Guards, an elite force that is separate from Iran's regular armed forces. "Kamangar, Heidarian and Vakili started their armed activities to overthrow the Islamic establishment in 2003 by creating PJAK group in Iran," IRNA said, quoting their indictment. "Four of them were also involved in a deadly mosque bombing (in the central city of Shiraz) in 2008." The blast killed 14 people. IRNA said Alam-Houli confessed to links with PJAK and that she had received orders from the group to carry out "terrorist" acts to create instability in Iran. "She was arrested when trying to plant a bomb underneath a vehicle near the Guards' headquarter in Tehran," it said. Like Iraq and Turkey, Iran has a large Kurdish minority, mainly living in the Islamic Republic's northwest and west. The United States, Iran's arch foe, in February 2009 also branded PJAK as a terrorist organization. The Islamic republic is locked in a dispute with the United States and its allies over its nuclear energy program which Washington fears will allow Tehran to develop nuclear weapons. Iran denies any such intention. TEHRAN, Iran — Iran's official news agency says five Kurdish activists have been hanged following their conviction of membership of armed opposition groups and involvement in bombings. The agency's report said the five, who include one woman, were hanged at Evin prison, north of the capital Tehran, Sunday at dawn. The five were sentenced to death in 2008 after they were found guilty of "Moharebeh," a term Iran uses to describe a major crime against Islam and the state. The agency said the five — Farzad Kamangar, Ali Heidarian, Farhad Vakili, Shirin Elmholi, Mahdi Islamian — were members of a Kurdish separatist group that says it is fighting for greater Kurdish rights in Iran.